In the past, America’s Got Talent has been one of NBC’s top rated shows. Will that trend continue so that it’s renewed for a ninth season? Or, could the ratings fall low enough for it to be cancelled instead? Time will tell. 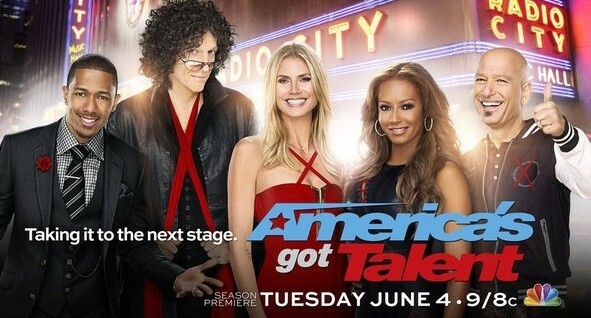 This time around, the judges are Heidi Klum, Howard Stern, Howie Mandel, and Mel B. Nick Cannon returns as host. Below are the ratings for the Tuesday episodes of the Summer 2013 season on NBC. These figures will be updated as the weeks progress so be sure to bookmark and return to this page to see how things are going. 2.4 in the demo (+4% change) with 11.19 million (+21% change). Season averages: 2.57 in the demo with 9.96 million. 2.3 in the demo (-4% change) with 9.24 million (+1% change). Season averages: 2.58 in the demo with 9.87 million. 2.4 in the demo (+9% change) with 9.16 million (+5% change). Season averages: 2.60 in the demo with 9.92 million. 2.2 in the demo (0% change) with 8.70 million (+2% change). Season averages: 2.62 in the demo with 9.98 million. 2.2 in the demo (-8% change) with 8.52 million (-3% change). Season averages: 2.65 in the demo with 10.08 million. 2.4 in the demo (-4% change) with 8.79 million (-6% change). Season averages: 2.69 in the demo with 10.23 million. 2.5 in the demo (-7% change) with 9.39 million (-4% change). Season averages: 2.72 in the demo with 10.37 million. 2.7 in the demo (-4% change) with 9.81 million (-5% change). Season averages: 2.74 in the demo with 10.48 million. 2.8 in the demo (+12% change) with 10.34 million (+3% change). Season averages: 2.75 in the demo with 10.56 million. 2.5 in the demo (-4% change) with 10.06 million (+3% change). Season averages: 2.74 in the demo with 10.59 million. 2.6 in the demo (+8% change) with 9.81 million (+3% change). Season averages: 2.78 in the demo with 10.68 million. 2.4 in the demo (-8% change) with 9.56 million (-7% change). Season averages: 2.82 in the demo with 10.86 million. 2.6 in the demo (-13% change) with 10.23 million (-13% change). Season averages: 2.92 in the demo with 11.18 million. 3.0 in the demo (0% change) with 11.75 million (+2% change). Season averages: 3.03 in the demo with 11.50 million. 3.0 in the demo (-3% change) with 11.52 million (+3% change). Season averages: 3.05 in the demo with 11.37 million. 3.1 rating in the 18-49 demographic with 11.22 million total viewers. Season averages: 3.10 in the demo with 11.22 million. Year-to-year, the premiere was down by 16% in the demo (vs a 3.7 rating) but was up by 8% in viewership (vs 10.48 million). Reference point: Last season, America’s Got Talent aired twice a week. The first weekly installments averaged a 2.9 demo rating with 8.33 million total viewers. Well done, AGT! See you next summer! We are now officially done watching America’s Got Talent. Judges are not funny or witty anymore . All wishy washy on hurting everyone’s feelings and the acts are horrible. Don’t think it should be renewed. How could it have fallen so far? Use the time slot for something good. Stopped watching it three years ago and I am still alive!!! THE JUDGES NEED TO KNOW TWO WORDS YES OR NO. COMINTARY BY JUDGES IS NOT NESSESSARY. THE SHOW IS GETTING VERY POOR. IT SHOULD BE ON THE LINES OF AUTHER GODFREY TALENT SHOW. YOU ARE BEGINNING TO LOSE A VIEWER. the judges need more talent then the people that come on the show .right? get rid of this crap and give us real tv. Hate it, never watch it. There are too many of these “talent” shows. Cancel it.